You might know that spiders aren’t insects (they’re part of the Arachnida group, not the Insecta) but many other spider myths still persist. Chances are you’ve called any old web a “cobweb,” thought you were being nice by putting a spider outside instead of killing it, and made wild claims about how many spiders people swallow in their sleep each year. Read on to learn what’s real, what’s fake, and where the most persistent alternative spider facts got their start. 1. ALL SPIDERS SPIN WEBS, WHICH ARE WHERE SPIDERS LIVE. Webs are not houses—they are made to catch food. And not all spiders spin webs: some get their dinner by hiding inside flowers or hunting. Their silk production isn’t limited to webs, either: Spider silk comes in seven different varieties, from durable draglines and parachutes to the kind used to wrap up prey. As far as scientists are concerned, “cobweb” isn’t just a synonym for a spider web. It’s a specific kind of web made by spiders from the Theridiidae family. Unlike the ritzy orb webs you might be more familiar with (like the one above), cobwebs are messy, three-dimensional webs that look more appropriate in a creepy house than a garden, though some Theridiidae species live outdoors. 3. SPIDERS WILL BITE YOU WHILE YOU SLEEP. Sorry, but they’re just not that into you. Spiders can tell the difference between a person and something they want to eat, and human sleeping sounds, like breathing and snoring, are pretty scary. Even if you roll directly onto a sheet covered in the critters, you’re more likely to make a mess than get hurt: spider fangs don’t stick up like dinosaur spikes. They’re on the other side, pointing down. 4. PUTTING SPIDERS “BACK OUTSIDE” IS NICE. We all have that friend who makes a face when we kill a spider. They would never do that. They put spiders outside, usually using some stressful combination of a glass and a piece of paper. While there are outdoor spiders and indoor spiders, however, many species can’t survive in both environments. If you want to be nice, put the spider in your neighbor’s house. Spiders don’t “come inside” in the fall, either. Those are just male spiders—who already live in your house—running around looking for a mate. 5. THERE’S ALWAYS A SPIDER THREE FEET AWAY. 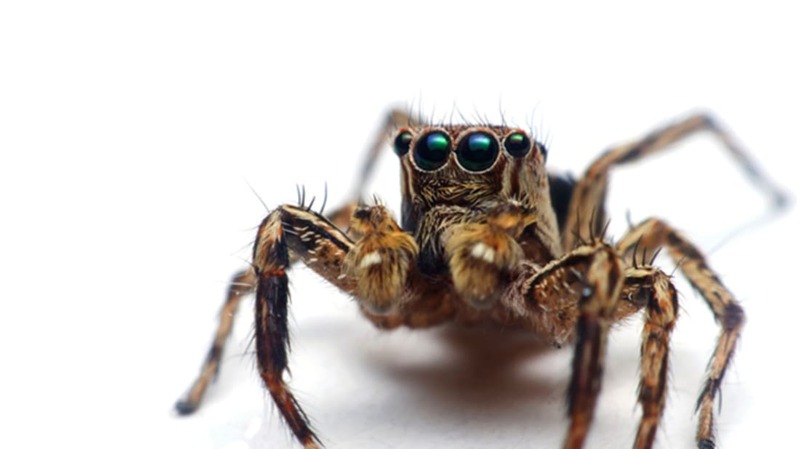 There are over 40,000 different species of spider in the world, so it’s not totally bonkers to assume there’s one around you somewhere, but science doesn’t have a precise estimate for how close they are to you at any given time. 6. IN FACT, THERE’S ONE UNDER YOUR TOILET SEAT. One of the most famous spider hoaxes involves an “allegedly deadly South American spider, Arachnius gluteus”—and that name should be enough to clue you in. While the original hoax, which began circulating in 1999, had obviously fictional elements—like a non-existent Chicago airport and a totally made-up scientific journal—recent versions sound more plausible. There still isn’t a venomous spider under your toilet seat, though—and if there were, it would be much more scared of you. Spiders’ reputations precede them: They’ve been blamed for everything from regular old aggression to eating their mates and laying eggs in the cheeks of little girls. Contrary to popular belief, some spiders can be quite charming when the mood strikes. Both male fishing spiders and male nursery web spiders who treat their ladies to silk-wrapped snacks experience more reproductive success than spiders who show up empty-handed; a study led by Dr. Maria Albo found that nursery web males with gifts were allowed to mate nearly ten times longer than their unromantic counterparts. 8. YOU SWALLOW EIGHT SPIDERS PER YEAR WHILE SLEEPING. We don’t swallow four spiders a year, eight spiders a year, 20 spiders in our lifetime, or any such number—unless, of course, you are a professional spider-swallower. “For a sleeping person to swallow even one live spider would involve so many highly unlikely circumstances,” Rob Crawford, Arachnid Curator at the University of Washington’s Burke Museum, writes. According to Snopes.com, this myth was started in 1993 when a columnist for PC Professional included it on a list of false facts. She was trying to prove how quickly misinformation spread via email and, well, that is definitely true: It looks like a magazine called PC Professional never even existed.